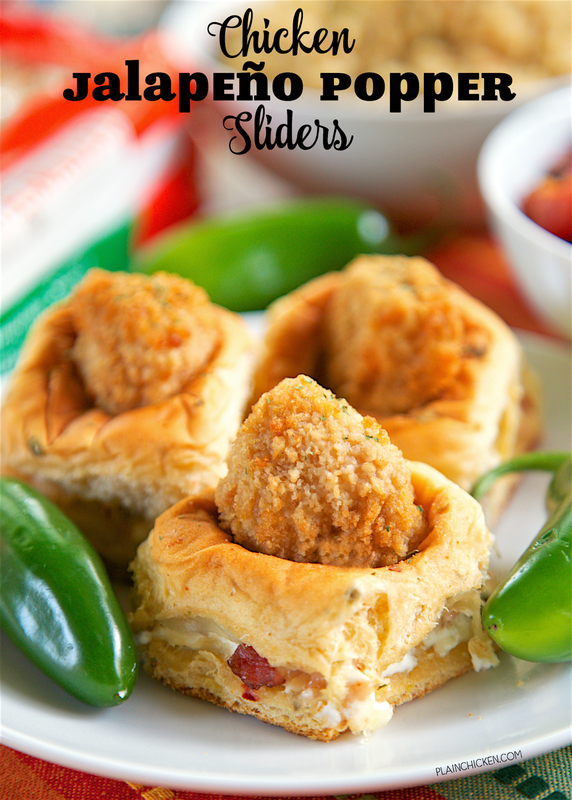 Chicken Jalapeno Popper Sliders - SO fun! Only 5 ingredients! 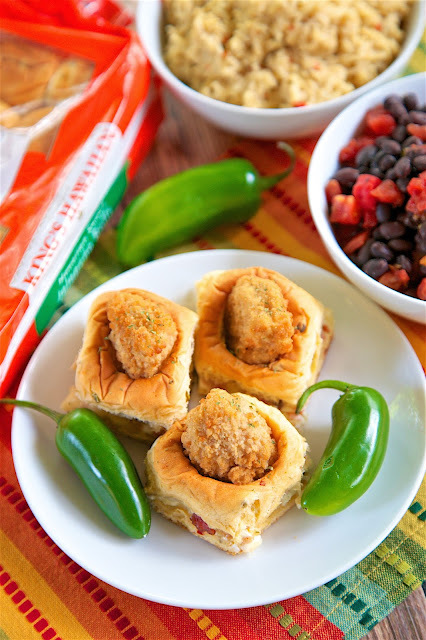 King's Hawaiian Jalapeño Rolls stuffed with cream cheese, bacon, monterey jack cheese and frozen chicken chunks. These sandwiches are CRAZY good! I couldn't stop eating them! Great for a party or easy lunch or dinner. I've got a last minute Cinco de Mayo recipe for you today. These Chicken Jalapeño Popper Sliders are super easy to make and they taste incredible. I couldn't stop eating these yummy sandwiches! They are SOOOO good!!! The secret ingredient in these Chicken Jalapeno Popper Sliders? 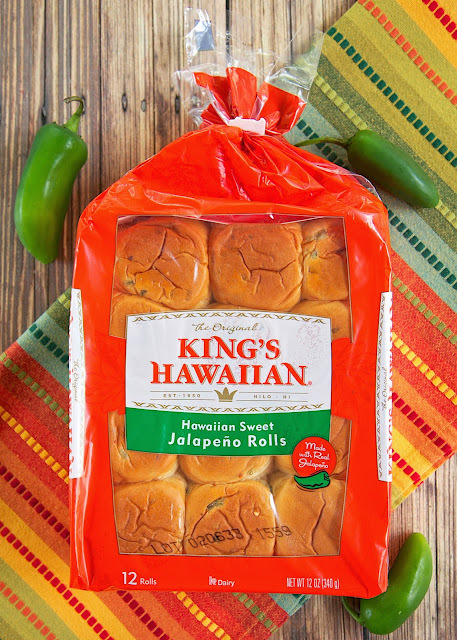 A package of the new King's Hawaiian Jalapeño Rolls. They give the Chicken Jalapeno Popper Sliders the perfect kick and jalapeño flavor. Have you seen these rolls yet? OMG! CRAZY good! They are great straight out of the package, but they put these Chicken Jalapeño Popper Sliders over the top! 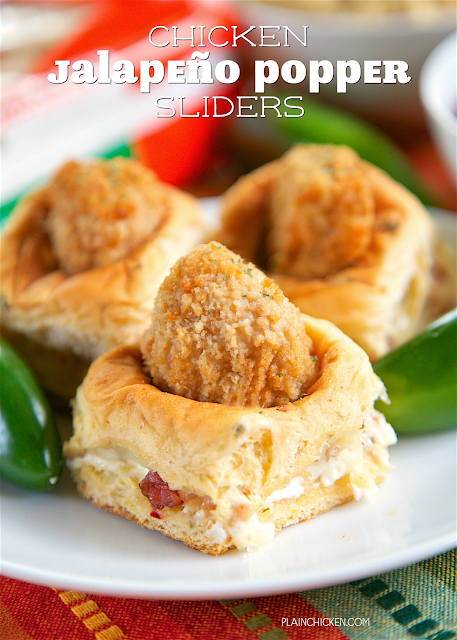 These Chicken Jalapeno Popper Sliders only take a few minutes to assemble. They are easy to make and so much fun to eat! You split the King's Hawaiian Jalapeño Rolls in half, spread some cream cheese, bacon and monterey jack cheese on the bottom half of the King's Hawaiian Jalapeño Rolls Cut some holes in the top half of the King's Hawaiian Jalapeño Rolls and place on top of the bottoms and stuff with some frozen chicken chunks. Cover with foil and bake. You can assemble the rolls ahead of time and bake when you are ready. I made a little step-by-step video for you below. I used regular cream cheese and regular monterey jack cheese, but you could always use some jalapeño cream cheese spread and pepper jack cheese if you want more of a kick. I thought the King's Hawaiian Jalapeño Rolls were plenty of kick for this recipe. Preheat oven to 350 degrees. Lightly spray a 9x13-inch pan with cooking spray, set aside. Cut King's Hawaiian Jalapeño Rolls in half horizontally. Spread cream cheese on bottom half of King's Hawaiian Jalapeño Rolls. Top cream cheese with bacon and monterey jack cheese. Using a 1-inch round cutter, cut a hole in the top of each roll. Discard bread rounds. Place King's Hawaiian Jalapeño Roll tops on top of bottoms. Place one piece of frozen chicken in each hole. Carefully place assembled rolls into prepared pan. Cover with foil and bake for 25 to 30 minutes. Cut into 12 rolls and enjoy!